“IADC and its members are looking forward to working with Administrator Pruitt on a wide variety of high-profile regulations that carry with them the ability to deeply impact oil and gas activities in this country. Given his background, and his Oklahoma roots, we expect that Administrator Pruitt has a unique understanding of our industry and the vitally important role it plays in the U.S. economy. In his committee hearing, he confirmed his belief that one can be pro-energy while also being pro-environment and stated unequivocally that the EPA serves a very important and very valuable role. On 6 February, IADC, along with 616 groups from each of the 50 states, signed on to a letter urging the U.S. Senate to consider and pass the Regulatory Accountability Act (RAA) of 2017. The RAA previously passed the House with a bipartisan vote of 238-183. The RAA would modernize the Administrative Procedure Act, whose rulemaking provisions remained virtually unchanged since it was enacted in 1946. By passing the RAA, the Senate would ensure that real structural reform is made to the way agencies adopt the most costly rules that fundamentally change the nation. The letter writers noted that, “The RAA stands for good governance and getting rules right by bringing transparency, accountability, and integrity to the rulemaking process at federal agencies. With the passage of RAA, Congress would be restoring the checks granted to it by the Constitution over a federal regulatory bureaucracy that is opaque, unaccountable and at times overreaching in its exercise of authority. For the full letter contents, please visit the US Chamber of Commerce website. On 28 February, IADC hosted a Lunch and Learn event in Washington D.C. for Hill staffers. The event, “IADC Onshore Drilling 101” gave IADC onshore members an opportunity to present information about the role of the drilling contractor in the well construction process along with industry safety data and featured a discussion on environmental stewardship. Scott McKee, Contracts and Marketing Lead, Cactus Drilling Company. Under the Jones Act, only US-flagged and qualified vessels can transport “merchandise” in which citizens hold at least a 75% interest in the vessel. Changes to the rule could require drilling equipment and consumables to be offloaded from the rig to US-flagged and qualified vessels for transport to the next well. Impacted equipment is likely to include risers, drill pipe and collars, BOP stacks and consumables, such as cement and chemicals. The costs associated with the new proposal could increase rig costs by more than $1 million, and moving the equipment to boats could easily damage the riser and other gear, resulting in further costs. IADC, API and IMCA, along with allies, are working the issue. The deadline for comments is 17 April, an extension from the original 17 February deadline. For more information, please visit the US Customs and Border Patrol website. The U.S. House in February continued to press forward with Congressional Review Act (CRA) disapproval resolutions to repeal Obama-era regulations. Among the CRA actions taken include H.J. Res 36 to repeal the BLM regulation related to methane emissions, a resolution to repeal a Dept. of Labor rule related to drug testing for unemployment compensation and to repeal a rule related to activities in the National Wildlife Refuge in Alaska. The U.S. Senate spent February confirming President Trump’s nominations including Scott Pruitt for EPA Administrator. Other cabinet posts filled include: Secretary of State, Office of Management & Budget, Small Business Administration, Veterans’ Administration, Treasury, Health and Human Services, Attorney General, and Education. The Senate also voted to approve the CRA disapproval resolution on the SEC rule related to natural resources extraction payments to foreign governments. President Trump issued a few Executive Orders this month, mainly related to crime reduction and reducing violence. To date, he has signed four pieces of legislation into law, including the CRA resolution repealing the aforementioned SEC rule. First-ever IADC student chapter established at Texas A&M University. Students and faculty were presented with a certificate of organization during the IADC Houston Chapter meeting in January. From left are Chris Menefee, Independence Contract Drilling; Andy Hendricks, Patterson-UTI Energy; Wendolyne Castillo, Treasurer, Texas A&M Chapter; Ron Lee, Noble Drilling; Zack Aldelamy, Secretary, Texas A&M Chapter; Dr Jerome Schubert, Texas A&M; Corey Wittig, Chairman, Texas A&M Chapter; Jason McFarland, IADC President; Zachary Matous, Vice-Chairman, Texas A&M Chapter. 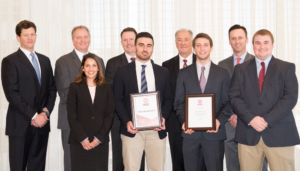 On 31 January, during the IADC Houston Chapter luncheon, IADC Chairman Andy Hendricks awarded students from Texas A&M University with a certificate of organization, recognizing them as the first-ever IADC student chapter. Texas A&M was selected to be the pilot IADC student chapter after students and advisors at the University expressed interest in forming a local chapter specifically to offer students an opportunity to engage directly with oil and gas professionals. Chris Menefee, Independence Contract Drilling and Ron Lee, Noble Drilling, both members of the Houston Chapter, were instrumental in working with the university to establish the chapter. Senior petroleum engineering major Corey Wittig serves as Chairman of the newly named student chapter. Additionally, the chapter’s leadership includes senior petroleum engineering majors Zachary Matous and Wendolyne Castillo and sophomore petroleum engineering major Zack Aldelamy. Dr. Jerome Schubert serves as faculty advisor for the chapter. Together, they will be working to provide networking experiences through regular meetings, technical workshops, well control courses and a golf tournament. They hosted their first chapter meeting on 13 February and welcome participation from students in all disciplines. IADC continues to engage with other universities who have expressed interest in forming local student chapters. On 20 February, Scandrill Inc. hosted Senator Ted Cruz at its drilling rig Scan Gold. The Scan Gold rig is shale rig outfitted with advanced walking system and 7500 psi mud system enabling it to drill in excess of 20,000’. Under the careful supervision of rig manager Joseph Schultz, Senator Cruz had the opportunity to get under the brake handle. 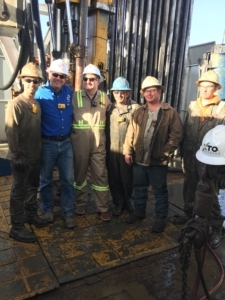 Senator Ted Cruz (third from left), with crew members of the Scan Gold rig during his visit on 20 February. The Canada-Nova Scotia Offshore Petroleum Board, in conjunction with the Canada-Newfoundland and Labrador Offshore Petroleum Board, recently jointly produced new draft Drilling and Production Guidelines. The new draft updates the previous release of 31 March 2011. The two boards are currently seeking comments on the draft guidelines. Comments are due no later than 10 April 2017 and may be submitted to consultation@cnsopb.ns.ca. To read the Explanatory Note summarizing the changes, please visit the Canada-Newfoundland and Labrador Offshore Petroleum Board website. IADC is coordinating comments on the guidelines. Member companies who wish to put forth comments for consideration and inclusion in the IADC response should email Jim Rocco at jim.rocco@iadc.org no later than 5 April 2017. The United States Computer Emergency Readiness Team produces a weekly US-CERT Cyber Security Bulletin, which provides a summary of vulnerabilities that have been recorded by the National Institute of Standards and Technology National Vulnerability Database. Those interested in receiving the bulletin can sign up to receive it via email or by subscribing to an RSS feed. PSA Norway recently issued a report of an in-depth study on the strengths and weaknesses of electrical installations on three facilities where there was not a dedicated emergency power system. The installations examined included a jack-up drilling rig and a mobile unit with a DP system. The report, which is available in Norwegian only, does not conclude that such designs should be restricted, but it does conclude that the existing regulations and norms could be improved, with specific reference to closed-bus operations. To read the Norwegian report, please click here. The US Attorney’s Office for the Eastern District of Louisiana recently announced that Wood Group PSN Inc., was ordered to pay $9.5 million in two separate cases involving their conduct in the Gulf of Mexico. Specifically, Wood Group PSN was ordered to pay $7 million for falsely reporting over several years that personnel had performed safety inspections on offshore facilities in the Gulf of Mexico (GOM), and $1.8 million for negligently discharging oil into the GOM in violation of the Clean Water Act, after an explosion at West Delta 32 in November 2012. Wood Group PSN was ordered to pay $700,000 in community service to projects in the areas where the criminal conduct took place. The company admitted that its employees were negligent in the way they authorized hot work on West Delta 32, and that a lack of communication between personnel on the platform contributed to the events that caused oil to be discharged into the GOM in a harmful quantity. Co-defendants Black Elk Energy Offshore Operations and Grand Isle Shipyards face manslaughter charges and Black Elk also faces eight felony counts of regulatory violations under the Outer Continental Shelf Lands Act. Charges against Don Moss, Christopher Srubar, Curtis Dantin and Grand Isle Shipyards that were dismissed by the district court are pending an interlocutory appeal by the government to the U.S. Fifth Circuit Court of Appeals. For more information, please visit the United States Attorney’s Office Eastern District of Louisiana Website. In February, petroleum engineering students at Texas A&M University participated in WellSharp training and testing, administered by Smith Mason & Co. 55 students completed and passed the introductory well control course. Smith Mason & Co. has, to date, conducted WellSharp Introductory courses at Louisiana State University and the University of Louisiana at Lafayette, in addition to Texas A&M. The course and certificate is presented to students free of charge. 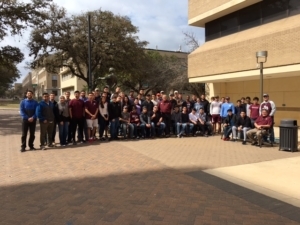 Texas A&M petroleum engineering students complete WellSharp training in February. IADC recently launched the Crane-Rigger Training and Assessment accreditation program, which offers a training standard that aligns with similar international standards while offering the support and credibility of accreditation. Included in the new program are curricula for basic rigging and crane operation. The program was developed by members of IADC’s Workforce Development Committee, comprising representatives from drilling contractors, operators, training providers and other stakeholder companies. The goal of IADC’s Crane-Rigger Training and Assessment is to provide a robust program through which training providers can be accredited and audited, which will lead to safer operations. The program is a globally-minded, affordable accreditation which aligns with, and surpasses, the API RP 2D standard. For more information about the IADC Crane-Rigger Training and Assessment accreditation program, please email crane-rigger@iadc.org. The online exam for IADC’s well control training and assessment program, WellSharp, is now available in Spanish. The Spanish translation is now available to all training providers. The exam was previously translated into Portuguese, and it will also be available in Arabic and Mandarin later this year. WellSharp, introduced in 2015, is a rigorous well control training and assessment program that offers content on prevention, situational awareness, barriers, barrier management, and risk awareness and management. It encourages blended learning to enhance the quality and value of the training, with required independently proctored electronic knowledge assessments and enhanced simulator exercises. For more information about WellSharp, please visit the IADC Website. The IADC Future Technology Subcommittee has issued a call for abstracts for the FT Spark Tank, scheduled for 0900-1130 on Wednesday, 5 April. To submit an abstract, click HERE. The IADC Future Tech Spark Tank is a strong opportunity to provide technology entrepreneurs a new opportunity to pitch their products and ideas to a panel of drilling contractors and operators. The Future Technology Subcommittee is part of the Advanced Rig Technology Committee. IADC Future Tech welcomes abstracts on any new technology that will improve efficiency or safety in well construction. The purpose is to provide insights (“sparks”) to technology developers into what matters to those they are innovating for. There is sometimes a vast disconnect between a good idea and a great product, and this series will attempt to close that gap in a good-natured, productive manner. Caveat: This forum is not designed to generate investments in the product or service. Each Spark Tank presentation should last no more than 15 minutes, which will allow the panel to ask questions. Similar to the television show “Shark Tank”, the panel will ask questions and give feedback on the presenters on just how great (or not!) they think the product is. The IADC Spark Tank is designed to allow technology entrepreneurs the opportunity to pitch products or ideas to a panel of experts comprising both drilling contractors and operators. The Spark Tank is envisioned as a forum to “spark” new thinking. The Spark Tank will be moderated by officers of the Future Technology SC and the Advanced Rig Technology Committee. Thirty minutes are allotted for each topic. Each presenter will have 15 minutes to speak. Please be as brief and concise as possible. Panelists will then use the remaining 15 minutes for questions and comments. Questions and comments will be candid. Please be polite and allow others to complete their thoughts before speaking. The Spark Tank is not a vehicle to seek investment for an idea or products, though “order of magnitude” estimate of development cost is acceptable. For more information about the IADC Future Tech Spark Tank, contact Mike Killalea, 713-292-1945, mike.killalea@iadc.org. IADC continues to expand the DrillingMatters.org website with the addition of a new video module. The new module teaches viewers about the challenges and rewards in deepwater. Drilling Matters.org is a multimedia, web-based tool to help educate regulators and the general public, with particular outreach to younger viewers. Tell your neighbors, friends and anyone you think can benefit from learning more about the industry. For more information about Drilling Matters, please contact Mike Killalea via email at mike.killalea@iadc.org. The May/June issue of Drilling Contractor Magazine will provide in-depth coverage of both land and offshore drilling, with an emphasis on resurgent shale drilling and hydraulic fracturing. The magazine will also provide special coverage of the US and Mexican Gulf of Mexico. In addition to reaching more than 33,000 readers, the May/June magazine will be additionally distributed at the Offshore Technology Conference, the IADC Drilling Onshore Conference & Exhibition and IADC World Drilling. The deadline for orders is 3 April, with advertising materials due on 10 April. For more information, please contact Bill Krull at bill.krull@iadc.org, or a local Drilling Contractor sales representative. The IADC Membership Directory will be published in April and is the definitive guide to the global drilling industry and offers an opportunity to connect with the global wellsite industry – rig owners both land and offshore and the oil companies they serve. The 2017 directory is an indispensable global reference of key operators, contractors, drilling rigs, suppliers and services for the full year of its useful life. More than 5,000 drilling and producing executives receive the directory, offering outstanding advertising value. To advertise, please access the 2017 Media Kit. IADC DEC Q2 Technology Forum - "Drilling Automation - Where Are We and Where Do We Need to Be?" IADC DEC Q3 Technology Forum - "Drilling Data - What Is Available? How Good Is It? What Can We Do with It?" PV Drilling: PV Drilling III (7). Viking International Ltd.: Rig I-9 (1); Rig I-27 (1).